Charles F. Tenney married Annis Helena Holcombe, daughter of Henry Garlick Holcombe and June Celeste Hill, on 9 September 1896. Charles F. Tenney died on 26 February 1902. James Martin Skeels married Annis Helena Holcombe, daughter of Henry Garlick Holcombe and June Celeste Hill, on 1 March 1906. James Martin Skeels died on 14 January 1910. 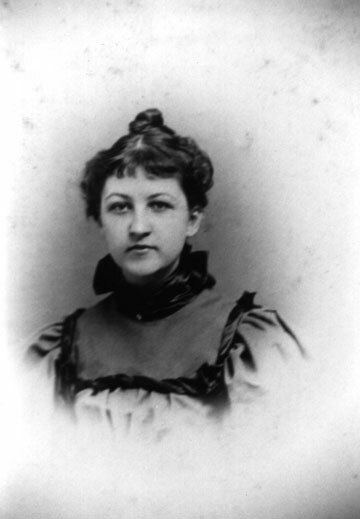 Alice L. Holcombe was born on 7 June 1844 at Isle La Motte, Grand Isle Co., VT. She was the daughter of Jesse Winchell Holcombe and Phebe Loop Hill. Oscar Alliston Holcombe was born on 12 July 1846 at Isle La Motte, Grand Isle Co., VT. He was the son of Jesse Winchell Holcombe and Phebe Loop Hill. Oscar Alliston Holcombe married Elvira Cornelia Hill, daughter of Henry Clay Hill and Cornelia Scott, on 29 September 1869 at Alburg, Grand Isle Co., VT.1 Oscar Alliston Holcombe died on 3 July 1909 at Plattsburgh, Clinton Co., NY, at age 62. Harry R. Cook was the son of Charles Cooke and Emma Lucy Holcombe. [S25] Hannah McPherson, Holcombe Genealogy, Page 112.1/Item A-8-1-1-9-1-2-3-1-2. Grace Cook was the daughter of Charles Cooke and Emma Lucy Holcombe. [S25] Hannah McPherson, Holcombe Genealogy, Page 112.1/Item A-8-1-1-9-1-2-3-1-3. Dr. Charles Reiners was the son of Henry Reiners and Grace Cook. Dr. Charles Reiners lived at Huntington, PA.
[S25] Hannah McPherson, Holcombe Genealogy, Page 112.1/Item A-8-1-1-9-1-2-3-1-3-1. Frederick Dudley Holcombe was born on 1 April 1925 at Rochester, Monroe Co., NY. He was the son of Chester Frank Holcombe and Louise Shelby. Frederick Dudley Holcombe died on 26 July 2007 at Hines VA Hospital, Hines, IL, at age 82. For Frederick Holcombe, architecture was a balance between creativity and practicality, and he used those principles as the corporate architect for J.C. Penney Co. and Hart Schaffner & Marx. "Clearly his focus was on retail for many years and . . . what he enjoyed was the whole idea that you could design something and then see it," said his son James. "He liked tangible results. He would visit the stores and pick out the fixtures and watch them physically being constructed into something that your get to see in use." Mr. Holcombe, 82, of Oak Park, died of multiple myeloma Thursday, July 26, in Hines VA Hospital near Maywood. He was very flexible with his ideas," said Albert Miripol, a former architect with Carson, Pirie, Scott and co. when Mr. Holcombe was corporate architect for Hart Schaffner & Marx. "Many of the stores he designed were when (the company) was a big force in the clothing business, and they had all these big stores across the country. He was very well liked and very talented." Mr. Holcombe was born in Rochester, N.Y., and raised in Avon, N.Y. His family lost their knitting mill business during the Depression but opened a confectionery and tobacco business, where Mr. Holcombe worked. He attended Syracuse University but was drafted in 1943 into the Army during World War II. He served as a staff sergeant in the Pacific theater. Upon his discharge in 1946, he resumed his education, graduated with an architecture degree and became certified. He married his first wife, Mary Elizabeth Green, in 1951. He started his career with Victor Gruen in Detroit. However, he wanted his young family to live overseas, so he became a private contractor for the Air Force in Germany. There he designed buildings at several bases. The family stayed in Germany from 1956 to 1961, when they returned to the States and moved to Connecticut. For the next four years, he worked for J.C. Penney, designing retail stores. In 1967 he was hired by Hart Schaffner & Marx as a corporate architect. He and his wife divorced in 1969. In 1975 he married his wife, Sue, and the couple lived in Chicago until 1980. Mr. Holcombe was then hired by the engineering firm Ralph M. Parsons and Co. to help plan, design and oversee construction of a new city, Yanbu, Saudi Arabia. "The plan was to build a city on the Red Sea so oil could be exported out the Red Sea," said his daughter Shelby Boblick. "He was literally building a city near the Red Sea." After his return in 1986, he remained with the firm in its Washington, D.C., office until he retired in 1991. He moved to Fontana, Wis., near Lake Geneva, and shifted his focus to freelance work and residential architecture. Mr. Holcombe was a member of the American Institute of Architects. In addition to his wife, son and daughter, other survivors include another daughter, Amy Dolce; another son, Christopher; 12 grandchildren; and a great-grandson. Alonzo and Mary J. were enumerated in the 1870 Granby, Hartford Co., CT, census, page 27, with Bertha. Alonzo and Sarah were enumerated in the 1880 Granby, Hartford Co., CT, census with Bertha and Robert. Servant Fannie Jones, black, age 31, and her mulatto child Flora were also recorded in the household. Robert appears in the 1900 census of Granby on page 7A, line 5, with Julia and his father, Alonzo. Julia and Robert had been married 6 years and had no children. Robert and Lizzabeth were enumerated in the 1910 Granby, Hartford Co., CT, federal census. He was a farmer, age 39, she was 22. Children in the household were Elliot 2, and Ralph 1. Also in the household was Alonzo 77, and Warren Drake, brother-in-law, age 20. Robert and Carrie E. were enumerated in the 1920 Windsor, Hartford Co., CT, federal census, district 201. He was a teamster age 48, she was 31. The only child in the household was Ralph, age 11. Robert and Carrie E. were enumerated in the 1930 East Granby, Hartford Co., CT, federal census, district 112. He was a teamster on a tobacco farm, age 58, she was 42. The only child in the household was Ralph B. age 21, working as a laborer on a tobacco farm. They were again in East Granby in the 1940 census. Robert was a teamster and Ralph was a die caster at a steel mill. [S161] Carol A. Laun, Granby Center Cemetery, Page 68/Item I-51. Charles and Mattie are recorded in the 1900 Granby census, page 7B, line 92, in the household of her parents. [S161] Carol A. Laun, Granby Center Cemetery, Page 16. Charles and Mattie appear in the 1900 Granby census, page 7B, line 93, living with Mattie's parents. They had been married three years and had had no children. Lewis was recorded in the 1900 Granby census, film T623-136, page 9A, line 21, single, living with his father as a farm laborer. Ann Skinner was born in 1639.2 She was the daughter of John Skinner and Mary Loomis. [S183] Gale Ion Harris, "unknown short article title." Cora Lois Jones was born on 29 November 1873 at Parsons, PA. She was the daughter of Cassius Owen Jones and Carrie Eliza Holcombe. Cora Lois Jones died on 24 November 1942 at Rochester, Monroe Co., NY, at age 68. She was buried at Maplewood Cemetery, Henrietta, Monroe Co., NY. [S25] Hannah McPherson, Holcombe Genealogy, Page 112.2/Item A-8-1-1-9-1-2-3-6-1. Katherine Holcombe Jones was born on 13 October 1875 at Wilkes-Barre, PA. She was the daughter of Cassius Owen Jones and Carrie Eliza Holcombe. Katherine Holcombe Jones married Irving Edwin Hartman on 28 June 1906 at Henrietta, Monroe Co., NY. Katherine Holcombe Jones died on 9 June 1958 at Rochester, Monroe Co., NY, at age 82. She was buried at Maplewood Cemetery, Henrietta, Monroe Co., NY. [S25] Hannah McPherson, Holcombe Genealogy, Page 112.2/Item A-8-1-1-9-1-2-3-6-2. Harriet Blanche Jones was born on 20 June 1878 at Rochester, Monroe Co., NY. She was the daughter of Cassius Owen Jones and Carrie Eliza Holcombe. Harriet Blanche Jones died on 9 June 1972 at Daytona Beach, FL, at age 93. She was buried at Maplewood Cemetery, Henrietta, Monroe Co., NY. Irving Edwin Hartman married Katherine Holcombe Jones, daughter of Cassius Owen Jones and Carrie Eliza Holcombe, on 28 June 1906 at Henrietta, Monroe Co., NY. Edwin Holcombe Hartman was born on 16 February 1913 at Rochester, Monroe Co., NY. He was the son of Irving Edwin Hartman and Katherine Holcombe Jones. Edwin Holcombe Hartman died in January 1986 at age 72. He was buried at Maplewood Cemetery, Henrietta, Monroe Co., NY. Herman Gaylord Remage married Fannie Ellen Holcombe, daughter of Alonzo Holcombe and Mary Ellen Steele, on 3 February 1897. Lois Louise Remage was born on 4 February 1899 at Paulding, OH. She was the daughter of Herman Gaylord Remage and Fannie Ellen Holcombe. Lois Louise Remage married Hoyt Shourds Armstrong on 30 June 1924 at Rochester, Monroe Co., NY. Lois Louise Remage died on 19 January 1967 at Rochester, Monroe Co., NY, at age 67. She was buried at Mt. Hope Cemetery, Rochester, Monroe Co., NY. [S25] Hannah McPherson, Holcombe Genealogy, Page 113.1/Item A-8-1-1-9-1-2-3-10-1. Hoyt Shourds Armstrong married Lois Louise Remage, daughter of Herman Gaylord Remage and Fannie Ellen Holcombe, on 30 June 1924 at Rochester, Monroe Co., NY. Elizabeth Austin was born on 20 April 1684 at Suffield, Hartford Co., CT. She married Benjamin Gillett, son of John Gillett and Mary Barber, on 6 September 1705 at Suffield, Hartford Co., CT.
Mary Dolbiar married Jonathan Gillett on 29 March 1634 at Devonshire, England. Cora Ivanilla Palmer was born on 11 November 1871 at Southwick, Hampden Co., MA. She was the daughter of Simeon Palmer and Emma Holcombe. Cora Ivanilla Palmer died on 12 April 1888 at age 16.